The Pilot CON-70 Piston fountain pen converter fills with a push button actuator. The Pilot CON-70 converter is for use with larger Pilot and Namiki pens such as the Pilot Custom 74, Pilot Justus 95 or Pilot Metal Falcon fountain pens. 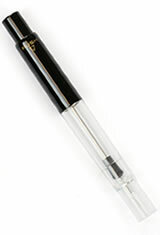 The Pilot CON-70 Piston fountain pen converter is made with a clear transparent body and a black cap and button. The Pilot CON-70 Piston Fountain Pen Converters usually ships within 1 business day unless otherwise specified. Each Pilot CON-70 Piston Fountain Pen Converters we sell is guaranteed to be genuine, authentic and will arrive brand new & unused! I prefer this piston over the CON-40; hold much more ink and the vacuum created by the pump action is great! Bought as a spare for my new Custom 912 with FA nib. It is slightly different in that it's all black and has 'Pilot' logo on it but I'm just as confidant in its functionality when it will be utilised. I live in Lancashire England and the service from PenChalet to the UK was really good, items requested 28th December arrived 4th January 2016 and considering the holiday season I feel this was very good indeed. I fully intend returning to PenChalet as a future customer, the emails I sent were responded to very quickly in a personable manner, and overall was a pleasant experience. Will the con 70 fit the vanishing point pens? No, it is too large. The Pilot Vanishing Point will only take the CON-40 or CON-50 converters. Will this work with the falcon set nib that you are selling for $144? The Pilot Falcon comes with a Pilot CON-50 converter. The CON-70 is too large to fit inside barrel of the pen. The Metal Falcon version is able to use the CON-70 converter.